Turner’s House Trust is a registered charity 1111653 and is registered with Companies House. The Trust became the owners of Sandycombe Lodge in December 2010, following the death of the last owner, Professor Harold Livermore earlier that year. The trustees raised £2.4m for the restoration of Turner’s House and conservation was completed in the summer of 2017. Turner’s House Trust is responsible for managing J.M.W. Turner’s House in Twickenham, one of the leading small historic houses in West London, which opened to the public in 2017 after substantial restoration. We are seeking to appoint an experienced person with an excellent record of achievement to join the Board and become the new Chair of the Trustees, as the current Chair plans to retire in 2019. This is an unpaid position and the time commitment is likely to be around 5 days a month. For practical reasons the Chair should live within easy reach of Twickenham. To request the full job specification, please email the vice chair, Michael Deriaz (mderiaz@btinternet.com). To apply for the position, please email a CV to Michael Deriaz together with a letter explaining why you believe you would be the right person to lead Turner’s House Trust. The closing date for applications is 30 April 2019, and interviews will take place in late May/ early June. Further information about Turner’s House and the work of the Trust is available on our website www.turnershouse.org. We are in the process of acknowledging our generous private donors without whom this project would not have been realised. This page will be updated further shortly. Turner’s House Trust thanks its many generous funding organisations who have made the conservation of Sandycombe Lodge possible. 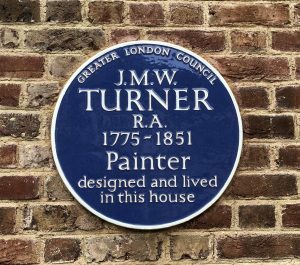 Turner’s House Trust would like to thank all the volunteers who have given their time and skills so generously over many years to help us reach the magnificent conclusion of our project to conserve J.M.W. Turner’s house in Twickenham. This very long list includes trustees, Friends of Turner’s House committee, guides, gardeners, stewards and many others. We look forward to adding many more names in the future as the story of Sandycombe Lodge enters a new phase as a small historic house, open to the public. It is a great achievement, and couldn’t have been reached without all your help. The Turner Society was founded in 1975 and has members worldwide. It is devoted to furthering the appreciation and understanding of the art of Joseph Mallord William Turner (1775-1851), who was not only Britain’s greatest painter but arguably the finest landscape and marine painter ever. Turner was enormously prolific, producing some 550 oil paintings, over 2,000 highly detailed and finely finished watercolours, and some 30,000 works on paper. His bequest to the nation is without doubt the greatest artistic legacy ever bestowed upon the United Kingdom (it is housed in Tate Britain, London, except for a few key works kept at the National Gallery). The Society regularly mounts lectures and informal talks given by the world’s leading experts on the painter; it organises out-of-hours viewings of important public exhibitions of his work, as well as visits to the Study Room at Tate Britain where the Turner Bequest works on paper are held; and it arranges trips to see private collections that include works by Turner. In addition, it publishes a fine magazine, Turner Society News, which goes to all members twice a year, and it works tirelessly to deepen awareness of the range and power of Turner’s astonishing genius. The Thames Landscape Strategy is a not-for-profit partnership for the river corridor between Weybridge, Hampton and Kew. Our aim is to understand, promote and conserve this special stretch of the river and to enhance its character – both natural and manmade. This collection also includes 4,400 works in the Richmond Borough Art Collection.